21:12 - Is This The World We Created...? - "Bohemian Rhapsody": Although it's a short medley version, it's one of the best performances of the ballad section, with Freddie nailing the Bb4s with the correct studio phrasing (for the first time ever!). - "Radio Ga Ga": Although it's missing one chorus, this is one of - if not the best - the best versions ever, Freddie nails all the Bb4s and sounds very clean! Spike Edney's Roland Jupiter 8 also really shines through on this mix, compared to the DVD releases! - "Audience Improv": A great improv, Freddie sounds strong and confident. You gotta love when he sustains that A4 for 4 seconds! - "Hammer To Fall": Despite missing a verse and a chorus, it's a strong version (possibly the best ever). Freddie sings the song amazingly, and even ad-libs a C#5 and a C5! Also notice how heavy Brian's guitar sounds compared to the thin DVD mixes - it roars! - "Crazy Little Thing Called Love": A great version, the crowd loves the song, the jam is great as well! Only downside to this is the slight feedback issues. 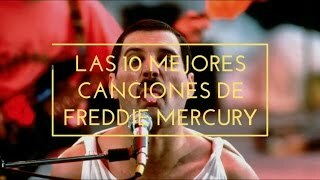 - "We Will Rock You": Although cut down to the 1st verse and chorus, Freddie sounds strong. He nails the A4, and the solo from Dr. May is brilliant! 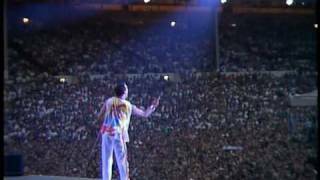 - "We Are the Champions": Perhaps the high-light of the performance - Freddie is very daring on this version, he sustains the pre-chorus Bb4s, nails the 1st C5, belts great A4s, but most importantly: He nails the chorus Bb4s, in all 3 choruses! This is the only time he has ever done so! It has to be said though, the last one sounds a bit rough, but that's a side effect of belting high notes for the past 18 minutes, with nodules AND laryngitis! - "Is This The World We Created... ? 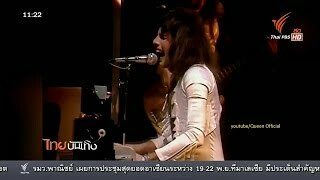 ": Freddie and Brian perform a beautiful version of this, and it is one of the best versions ever. It's both sad and hilarious that a couple of BBC engineers are talking over the song, one of them being completely oblivious of the fact that he is interrupting the performance, on live television... Which was being televised to almost 2 billion homes. All rights go to their respective owners!